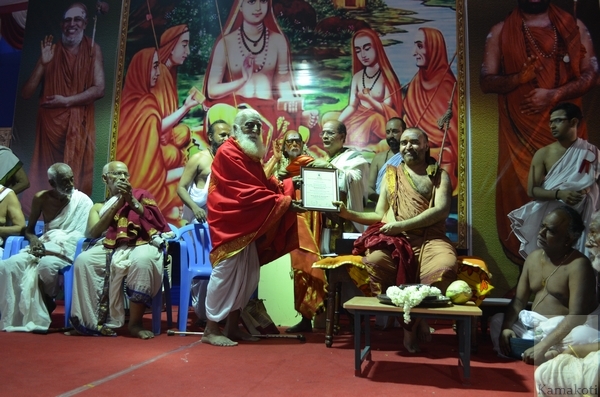 The Management, Staff & students of The Madras Sanskrit College conducted the 10th year celebrations of the AATMAS, Alumni Association of The Madras Sanskrit College on 24.5.2015 in the divine presence of His Holiness Pujya Shri Shankara Vijayendra Saraswathi Shankaracharya Swamigal. The programme started with Vedic invocation and College Prayer song. 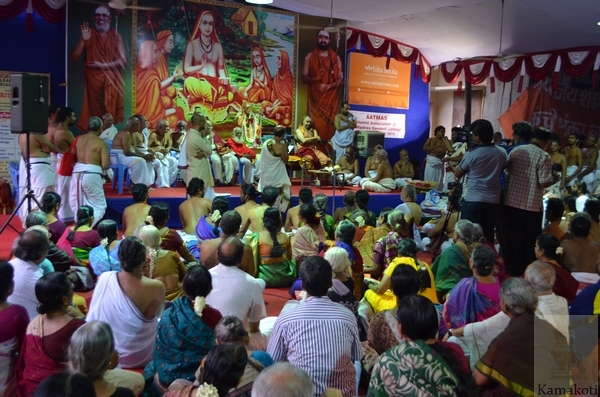 It was followed with Presidential Address�by Shri Vishwanathan. The Secretary of Alumni Association and retiring Principal Prof. N.V. Devi Prasad welcomed all the scholars and alumni of the college. The senior most Alumni Brahmashri. 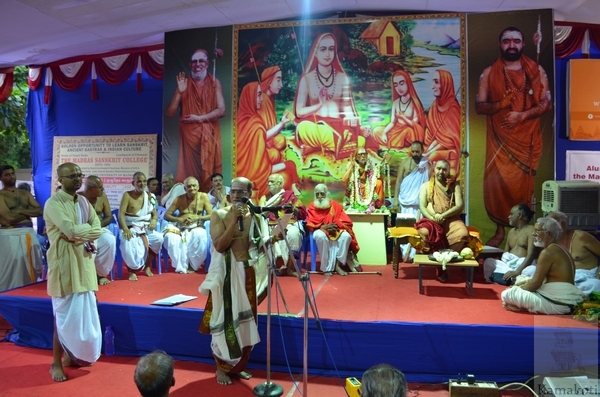 Ramakrishna Dikshitar, Siva Sri Sambandha Shivacharyar, Brahmashri R. Krishnamurhty Sastrigal, Dr. U.Ve. 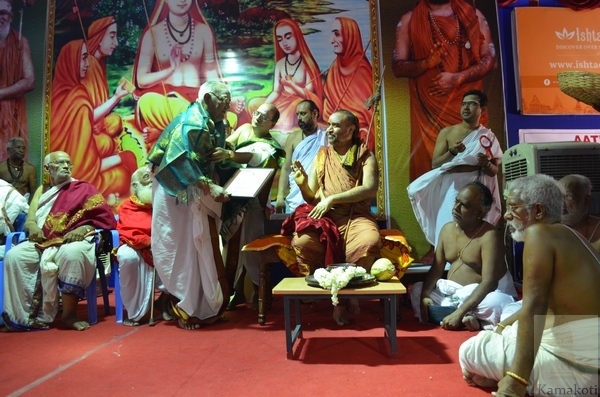 Vasudevachariyar and others were honoured. 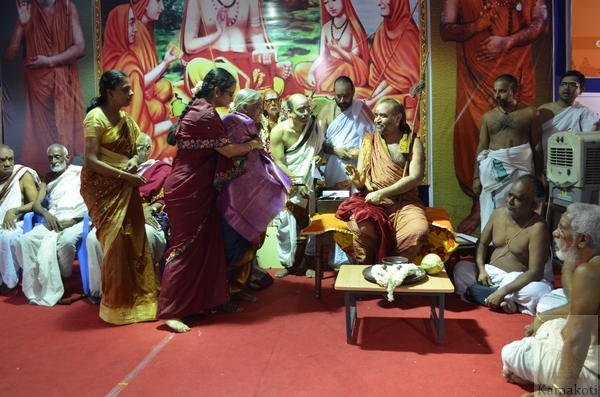 HH Pujya Shri Shankara Vijayendra Saraswathi Swamigal then blessed the devotees with his Anugraha Bhashanam. His Holiness started his speech on the subject of Sanskrit and cultural development in Nepal. His Holiness said that in spite of adverse climatic conditions the Mountain country faces, it has maintained its libraries well which contain rare type of manuscripts in Sanskrit language which shows their dedication & devotion towards knowledge. His Holiness recalled his visit to the Nepal libraries. Special mention was made regarding the cultural ethos of the people of Nepal. Continuing, His Holiness quoted Kalidasa's famous coinage "Saraswathi Shrutimahati Mahiyataam" meaning "let wisdom, whose greatness is because of Vedas, blossom" and said that Sanskrit language has the rare distinction of being the language of the Vedas. His Holiness said that learning of Sanskrit language will help in development of Satvik thinking and action. HE also said that by learning of the language a huge and varied avenue of wisdom is opened since many sciences like Ayurveda, Astonomy, Astrology, Shastras like Mimamsa, Tarka, Yoga, epics, literary works, Puranic treatises, stotras etc are available in the language. His Holiness spoke in length about the contribution of college in gifting Sanskrit Pandits for the country. Noting the presence of many senior scholars, some President awardees, His Holiness said that the Alumni meet may well be called as senior scholars' awarding function. His Holiness also recalled the association of the college with the Kanchi Math since many years. His Holiness urged for more students and people to take up study of Sanskrit language. The function continued with a Sanskrit drama based on the theme Maitreem Bhajata and a Carnatic music recital by the alumni association.